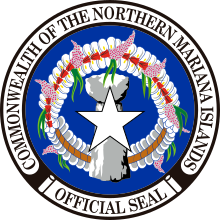 The Seal of the Commonwealth of the Northern Mariana Islands takes its inspiration from the United Nations, as the NMI had once been a UN Trust Territory. The blue field is superimposed with a white star and a latte stone, a Chamorro house foundation. The decorative wreath or mwarmwar was added in 1981, and maintains the link between the islands and its sacred history and customs. This Northern Marianas-related article is a stub. You can help Wikipedia by expanding it. This page was last edited on 15 August 2017, at 17:12 (UTC).